Which option is best for your startup? Startups have several options in the journey toward becoming successful companies. The diagram below is a summary of solutions available to inventors and entrepreneurs who are passionate about their business ideas. IdeaPros is the world’s first Super Venture Partner™. We are the last partner you will ever need. If you’re an entrepreneur, you’re an inventor – creating something different, better, ground-breaking. Whether it’s a product or an app, there may be different solutions you’re going to look at to help get to market. Your idea is like a baby. In its infancy anything is possible. You have high hopes for it. If you feel your idea is almost as important as your baby, making wise choices about how to raise it to make a profit as a full fledged product is critical. First you need to create the company that is going to be the face of everything you do. What does your company stand for? How is it differentiated? The most common solutions that entrepreneurs utilize include the list below. In this guide, we define the choices you have depending on your business stage. We also share who each option is designed to best support. You’ll be able to identify the solution that is right for you and what to do next to launch successfully. These companies may help you get a provisional patent but they will not validate the viability of your product in the marketplace. This usually results in unacceptable success rates (<.001%) when trying to achieve a licensing deal. A patent is NOT the best first step because a product-market fit has not been established. IdeaPros is NOT an invention promotion company or an invention marketing firm. We are a Super Venture Partner™ that takes an equity interest in startups with innovative products or apps to bring to market; we are more akin to an incubator or an accelerator. Super Venture Partner™ (SVP) – a hands-on partner for any entrepreneur who wants to create a company that will bring their product to market in about 25% of the time and money it would take you to do it yourself. You’ve probably never heard of this solution until now. There’s a reason for that. 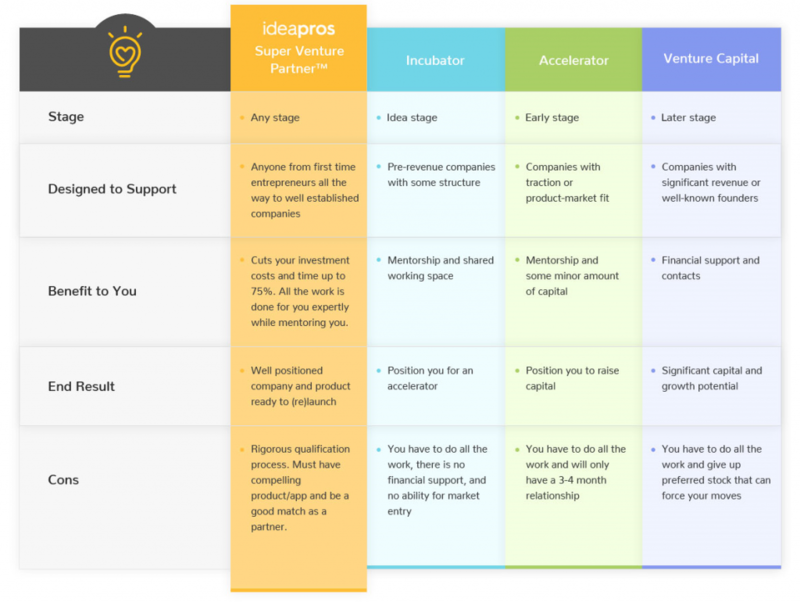 IdeaPros is the very first firm to offer done-for-you business development at any stage as your Super Venture Partner™. A SVP has the experience, expertise and infrastructure to help you turn your idea into a viable product and bring it to market. The SVP does all the heavy lifting that you either don’t know how to do or would rather hire out. As a partner, a percentage of the profits are shared, and YOU become the partner responsible for the business once it’s ready to launch. Incubators – offer advice and training and no financial support. If you want to learn from the ground up and dig in and get your hands into the trenches of building a business, you can get some decent guidance from an incubator. The advice you get may work and you may wind up having to try several paths before you get it right. The risk with taking your baby to an incubator is getting stuck somewhere along the line or choosing to spend money in a direction that ultimately breaks down. Accelerators – give you a nice push by offering advice and mentorship and are best for those who have experience developing a company and bringing other products to market and want to do all the work. If you are an early stage company, you will benefit from the 3-4 months of support you may get as well as some small financial help. Venture Capital – generally only available to companies in later stages of development. This is what many founders aim for, but shouldn’t be the end goal. Venture capitalists manage the funds for limited partners who expect exceptionally high returns on their investment. Therefore, VC funding is highly competitive and selective, and the median VC funding round size is usually at least $1 million. A note about Shark Tank. When you think about the TV show Shark Tank where the “sharks” invest in your idea, they typically want significant ownership and typically require you to already have sales. This often works out poorly for the inventor/entrepreneur. Plus the shark typically does not do any of the work for you. “Even if Shark Tank approached me, I’d say no thank you because I have IdeaPros.” – Suzette L.